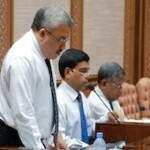 Minister of Finance and Treasury Abdulla Jihad has told parliament’s Finance Committee that this year’s budget deficit can be expected to be double the original estimate of MVR3billion (US$195million), reported Haveeru. Jihad is said to have explained that the bulk of the deficit came from unpaid bills left over by the previous government, amounting to MVR2billion (US$130million). 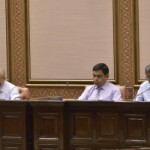 During the committee’s meeting, which continues regardless of the status of the Majlis (currently suspended), Jihad also said that an additional MVR800million (US$52million) had been paid out from this year’s budget. He said that this year’s revenue is expected to be MVR11.5billion (US$746million), whilst total expenditure is MVR14.6billion (US$948million). Meanwhile, he reported that state spending this year, MVR9billion (US$590 million), had outstripped earnings by 28percent. These figures represent an improvement on the Finance Committee’s earlier estimates which, in May, had anticipated a deficit of MVR9.1billion (US$590 million) after meeting with Jihad. The committee is also reported to have given the go ahead to take out a further US$25million loan from India.